A senior Birmingham councillor has accused the leader of the Respect Party of supporting terrorism by refusing to join an ovation for a British marine. Salma Yaqoob, also a city councillor, did not stand when the marine who had been awarded the George Cross, entered the council chamber on Tuesday. Ms Yaqoob said she did not stand as she was against the war in Afghanistan. Liberal Democrat Martin Mullaney posted online that she would have applauded a suicide bomber. She denied the claim. L/Cpl Matt Croucher, from Solihull, was awarded the George Cross for bravery for throwing himself on top of a Taliban grenade in Helmand in 2008 to protect his colleagues. His rucksack absorbed most of the impact of the explosion and he survived with minor injuries. In a statement on Friday he said: "I feel all service personnel should be shown respect irrespective of the political climate." In a BBC interview on Friday Mr Mullaney said he stood by his comments on the Re~Stirred public forum where users debate local news and current affairs. The post said: "I can only assume that if one of the failed 21/7 London suicide bombers had been in the Council Chamber last Tuesday, Cllr Yaqoob would have been demanding the Council applaud the failed suicide bomber for their past 'heroic actions." He told the BBC he had been angered to see Ms Yaqoob and another Respect councillor Mohammed Ishtiaq sitting with their arms folded. Mr Mullaney, a ward member for Moseley and Kings Heath and cabinet member for leisure, sport and culture, said: "This soldier deserves the respect of the council and can I add, Muslim councillors from the Labour Party, Conservative Party and Liberal Democrats were standing up and clapping him as well. "But I feel disgusted by Salma Yaqoob and I put those comments on the Re-stirred message board. 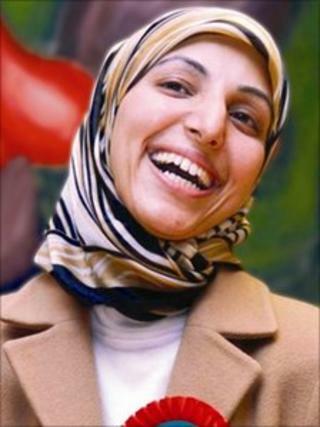 "Salma Yaqoob in the past has described the 7/7 suicide bombing as reprisal attacks for US aggression. I question where exactly she is coming from." Ms Yaqoob said her refusal to join in the ovation was not premeditated as the marine's arrival was not listed on the meeting agenda and took her by surprise. "Not joining in was not at all aimed at Matt Croucher as I have pointed out before," she said. "My refusal [was to] stand with these hypocrites, who say they applaud the bravery of the soldiers, but who do not have the moral courage to question their own leaders as to why we are sending them there, so they are put in harm's way in the first place. "The fact Martin Mullaney chooses to twist that and put words in my mouth and go as far to say I would condone suicide bombing I think is absolutely appalling. "I was the one who said not in our name when 7/7 happened and I have been consistent in denouncing, condemning, attacking any extremists who justify suicide bombing or other such heinous acts, and the fact I have an anti-war stance should not detract from that."